Fruity King Casino will then reward you with a bonus (Welcome Bonus is for new players only). The terms and conditions of the bonuses vary between different casinos and might also change over time and between different countries, so it is important to compare the different offers and read the T&C for Fruity King Casino before signing up. When the name of an online casino is Fruity King Casino, you would probably expect it to be a slot specialist and you wouldn’t be wrong. However, at FruityKing, launched in 2014, you can find much more than old good fruit machines. The gambling site offers a full range of casino games including live dealer tables and it focuses on UK players. What’s more, the site is fully optimized for mobile play allowing its customers to enjoy the gaming content on the move too. With two reputable gaming bodies, the Malta Gaming Authority and UK Gambling Commission, monitoring its operations, FruityKing will provide you with hours of top-notch entertainment in a safe and fair environment, generous incentives and around the clock customer support taking care that everything goes smoothly. 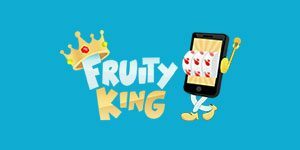 Running on an instant-play multiplatform, Fruity King Casino is accessible from all kinds of mobile and desktop devices with no download needed. It boasts a collection of 435 titles at the moment of writing this review including products from the industry giants like NetEnt, Microgaming and NextGen Gaming, but you won’t miss out releases from lesser yet successful gaming companies such as Quickspin, Rabcat or Thunderkick. Slots are the most numerous games at Fruity King Casino with the latest titles added on a regular basis. You can browse the dedicated categories Slot Games, Feature Games and New Slots to find the title you are looking for. Some of the most popular slot machines ever like Immortal Romance or Starburst are on offer along with innovative titles like White Rabbit by Big Time Gaming or Neon Jungle by Iron Dog Studios. Should you seek thrills, explore the Jackpots section and play progressive slots like King Cashalot or Treasure Nile awarding ever-increasing payouts. If table games are your cup of tea, browse the Blackjack section offering 12 virtual tables or the one offering 14 Roulette variants. The virtual table games selection may seem a bit limited with no Baccarat or Poker variations, but the fun does not end here. Under the Video Poker category, you will find 5 game variants including Jacks or Better, Double Bonus or Deuces Wild. Live Casino is powered by Microgaming and NetEnt and here you can choose from 12 Roulette, Blackjack and Baccarat tables operated by live dealers. If you prefer more immersive gaming experience, check out this section of FruityKing. FruityKing supports a great number of banking methods you can use to fund your account and withdraw your winnings from it. They include major credit and debit cards like Visa, MasterCard, Maestro, Diners Club and more. Users can also use Pay by Phone service to make their payments with their smartphones or e-wallets such as Neteller or Skrill for instant deposits and fast withdrawals. Other methods include iDEAL, Sofort, Giropay, PaySafeCard, Trustly, Qiwi, WebMoney, Fast Bank Transfer and Euteller. FruityKing accepts a number of currencies including British pounds sterling, US dollars, Euros and Swedish krona, but you should check out which currency you can use for a preferred banking option. As for withdrawals, you are allowed to cash out from £50 to £3,000 per week or £30,000 per month and your requests may be subject to a 3-day pending period. As we have already mentioned, the customer support team will be at your disposal 24/7, so if any problem occurs, feel free to contact them via live chat or email. No phone line is available at the moment, but you can visit the FAQ section and find answers to the questions that bother you before contacting friendly and reliable customer support agents.